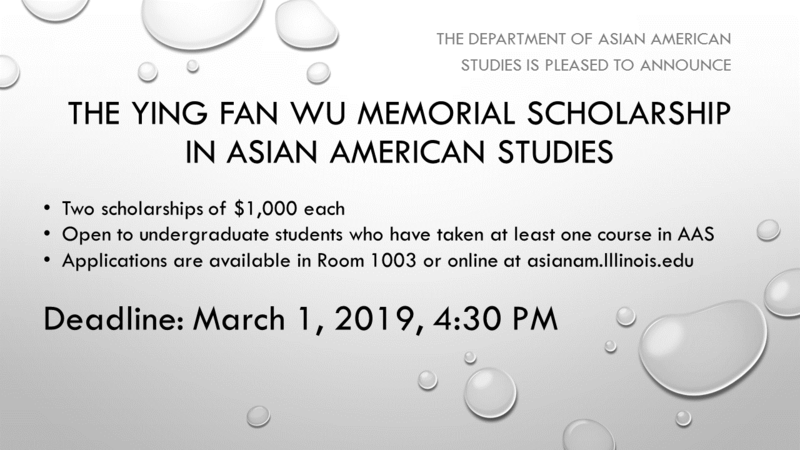 pleased to announce the renewal of the Ying Fan Wu Memorial Scholarship, to be awarded as two scholarships of $1,000 each to outstanding students in Asian American Studies. 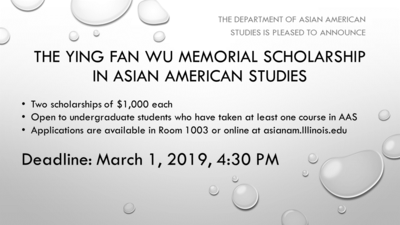 Any student who is currently enrolled in or has completed a course in Asian American Studies is welcome to apply and will be duly considered. alumnus, Mr. Horace Wu, and his wife Kate King Wu in honor of Horace Wu’s father, Ying Fan Wu, who attended the University of Illinois in the 1930s. To access the scholarship application, click HERE. Please note that you must DOWNLOAD the form before filling it out - you cannot fill it out directly from the webpage.